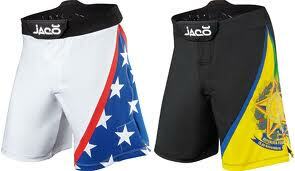 The Jaco Shorts are my favorite shorts because they come in multiple colors. Functionality is important to me, but I would buy more than one pair because I like the idea of owning them in several different colors. To me, MMA is all about having fun. I enjoy MMA is why I do it so it's only fitting to wear shorts that are fun. I mean, check out these super fun designs! I have a pair of these shorts and have actually caught an opponent paying more attention to my shorts than my moves which worked out quite well for me!